Trusted eSoftTools newly developed Free EDB Recovery Software that has easy process to repair corrupted/damaged exchange file and used for EDB Recovery to PST Outlook file. Free EDB File Recovery Software will recover EDB to PST, MSG, EML, EMLX and HTML format without involvedness. 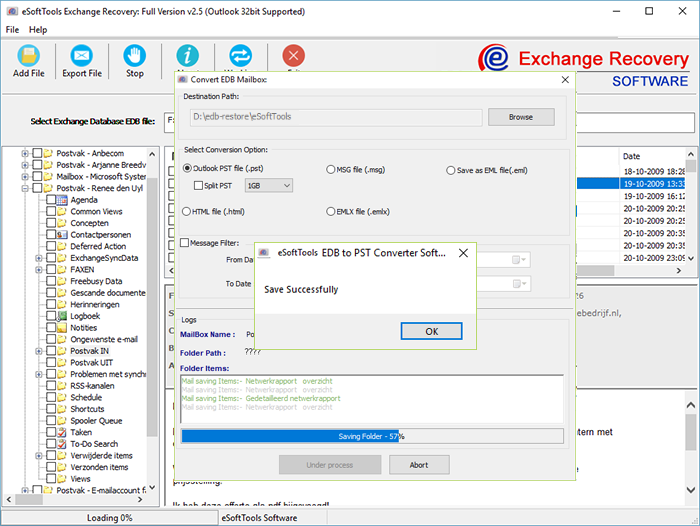 EDB to PST Recovery Software scans larger exchange EDB File and removes all errors for making better EDB File Recovery to PST along with emails, calendars, contacts, task, notes & appointments. Successful program for EDB Recovery to PST with repair exchange users mailbox items- inbox items, outbox items, journals, task, notes & appointments. Create Unicode PST File that you can open in any MS Outlook versions included- 97, 2000, 2002, 2003, 2007, 2010, 2013 and 2016. Download Free EDB Recovery Tool for help users to see the preview & convert 30 items each folder. 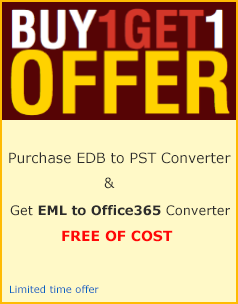 Quick use Free EDB Recovery Software that perform easy to removes every error and recover EDB File to PST Outlook file. It scans all types of EDB file like- Unicode EDB File, priv1.edb file and Pub1.edb file and successfully produce easy way for EDB to PST Recovery along with attachments & emails. 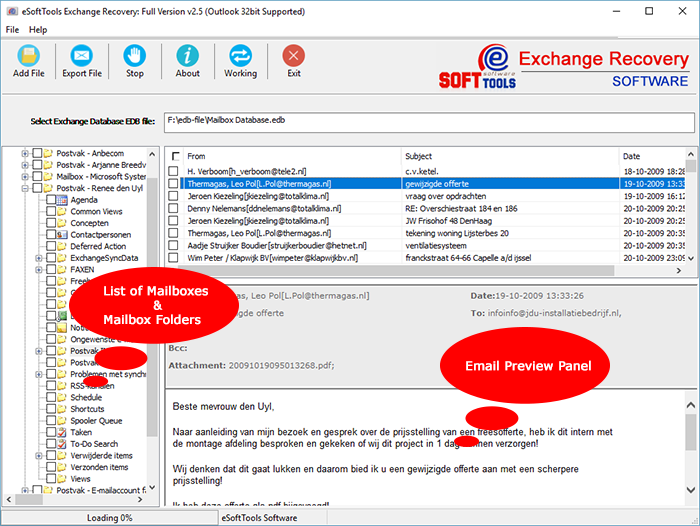 Here provided the advanced feature now all exchange file clients can use this EDB Recovery Tool to recover EDB to PST, MSG, EML, EMLX and HTML format with extract EDB emails, calendars, notes & other users mailboxes items. Free EDB Recovery Software preserve folders, sub-folders and zip attachments. Wonderful EDB Recovery Tool easily take off every issues and recover EDB file but during EDB Recovery to PST Software that software provides option to split the oversize PST File by define size from 1 GB, 2 GB, 3GB, 4 GB and 5GB. Free EDB Recovery Software save outlook file from its 2GB size corruption issues by splitting. With advanced EDB Recovery Tool that users can define the two dates “ the starting dates “ and “ the last dates” for emails recovery from exchange file data and convert EDB to PST Outlook file with maintains all emails attachments, zip attachments and embedded images. It supports all MS Outlook versions and exchange file versions included 2016, 2013 and below versions. Free EDB Recovery Software supports all users that according to need they are capable to select the folders and emails from their out-of-the-way EDB file and after selection very fluency Recover EDB to PST Outlook file. It supports for EDB to PST Recovery along with extract all EDB mailbox items and emails attachments. Demo Restrictions - Try free demo version and recover 25 edb file items from each folders. 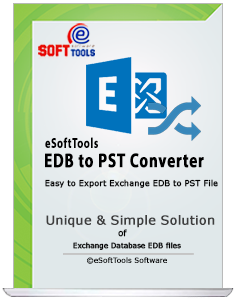 Now Exchange EDB File ready to convert and exoprt edb to PST file.